Any designer or builder will tell you, the key to a successful project is the ability to identify the needs and wants of the customer. Easier said than done! And even more complicated is the ability to speak to a younger, hipper client about technology and the role it plays in modern architecture. The homes of the future are much more likely to be outfitted with “smart technology”, and you, as the designer or contractor, need to be ready to incorporate or, retrofit these systems. So, who is this client? What features do they want specifically? How much are they willing to spend? What are the latest trends in smart home technology? The 2014 State of the Smart Home Report http://www.icontrol.com/insights/2014-state-smart-home/ has uncovered some interesting information regarding smart home trends and adoption. 35-44 year olds (who represent the majority of new home buyers) are the most interested in smart home features. And technology enthusiasts (who represent 32% of the market) are increasingly adopting automated systems. Home security is the most important feature of a smart home system. 90% of the report’s respondents said personal and family security is the primary reason they would invest in this technology. Home security features include alarms, cameras, secure doors and windows, outdoor lighting, as well as smoke and carbon monoxide detection. The second most important feature is energy management. 78% reported that the ability to reduce utility bills and be environmentally responsible was very appealing. Additionally, interconnected appliances, lights, thermostats and irrigation systems that can be managed remotely by phone or by the internet offers convenience and added efficiency. Convenience is important! 40% of the study’s respondents want to be able to turn the lights on remotely, 14% want their home to unlock the doors, 23% want the thermostat to adjust according home occupancy, and 13% want the garage door to open. So how much are people willing to pay? The report showed that about 50% of home owners are willing to part with anywhere from $500 to $3,000 for a smart home system. Luxury homes have been incorporating this technology for years, a higher end market will undoubtedly be willing to invest much more. Bill Gates’ $147.5 million house is a connected home marvel! 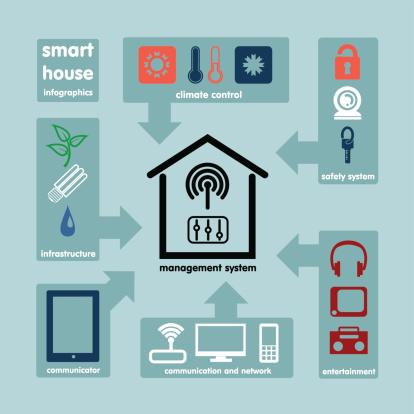 Will smart home technology be commonplace in the future? Probably. Industry analysts predict that 17% of homes will have some sort of “smart” technology by the end of 2014. http://www.techradar.com/us Many of the leaders in home technology – Apple, Samsung and Google – are forging ahead by investing in system manufacturers. As technology continues to improve, and become more and more consumer driven, the appeal of automated home systems will grow. By offering innovative new technologies, designers and builders can differentiate themselves, win new customers, and ultimately increase revenue. Follow us on Twitter @ConEdTraining, I also post to Certified Training Institute or check us out on Facebook and linkedIn.